With so many eateries opening all over Auckland, it’s hard to know where to start. That's why we've written this one. Consider this your CBD crash course. Auckland city centre is a good place to get a feel for food scene: the busy streets, frothing espresso bars, big crowds and flashing lights. It's definitely a got a good vibe going. So where should you eat in Auckland CBD? Here's our list of best restaurants and cafes in the city centre. Starting the list off with an Auckland classic. Best Ugly Bagels whip up the best hand-rolled and freshly toasted bagels in town. Just like the CBD, Best Ugly is fast-paced and buzzing with sounds from the kitchen (usually banging fresh dough on to tables), while retro-pop hits play in the background. Constantly packed, Best Ugly is a must for all Aucklanders. There's an endless list of potential toppings, but our faves would have to be the Yodi. It's a freshly toasted bagel with habanero mustard, thick-cut of pastrami, melted Swiss cheese and salty pickle. NOM. Right next to the bustling bagel shop is Odettes Eatery, a more relaxed dining experience. With an emerald green palette that sparkles in the mid-morning sun, Odettes is all about modern sophistication. 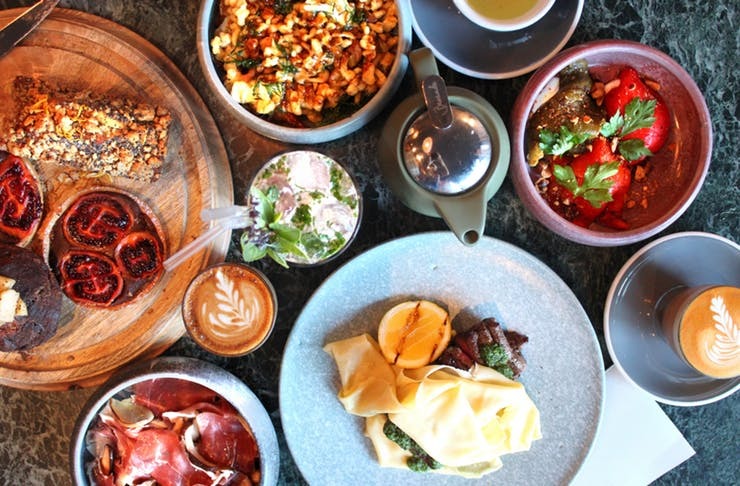 It's also got some of the best brunches in Auckland, which include their infamous wild mushrooms and fries with fried curry leaves and honey mustard. By night, Odettes becomes a candle-lit and oh-so-romantic date spot. The lamb shoulder game became real after Odettes entered the Auckland foodie scene: it’s soft, tender, succulent and packed with so much flavour from the massaman hummus. Outrageous. Take a small trek up the hill and make your way to Federal Street, where you'll find some of Auckland’s top eateries. 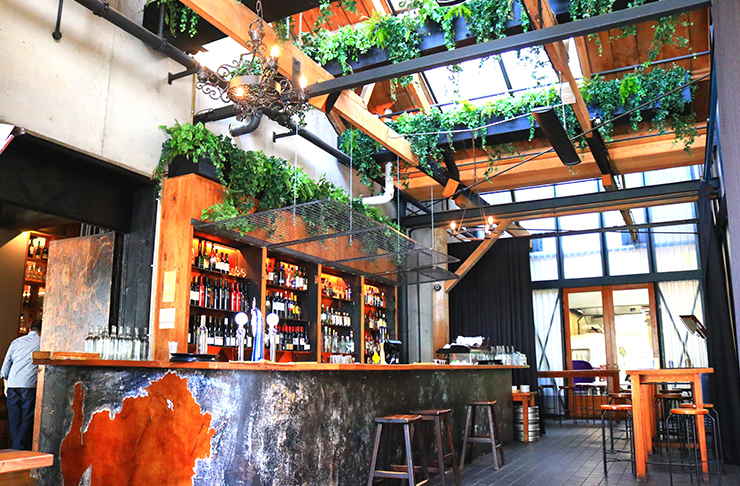 Depot Oyster Bar & Eatery has earned a rep for being an Auckland foodie icon. From the clams and fresh-shucked oysters to the desserts (like their sugar pie and hot cookie on a skillet) Depot always brings the ruckus. Make sure you order a round of their infamous turbo sliders too—they're an absolute must. Think tender pieces of fish and mayo sandwiched between two buttery buns. Simple but oh so tasty. Curry night has never tasted this good. 1947 Eatery offers a modern twist on Indian cuisine, and Aucklanders have been lapping it up. With go-to favourites like the butter chicken and garlic naan on offer, 1947 takes things up a notch. Just check out the butter chicken fries (yep, really). They come out crispy and seasoned with curry powder, topped with butter chicken sauce, melted cheese, onion and coriander. Don’t be afraid to branch out and try their goat biryani either. It's the most flavoursome, fragrant and fluffiest bed of rice in town. When you’re wanting a banger of a meal, but don’t want to stress the wallet, Osaka Restaurant is where it’s at. Very popular with students, this one. Serving Korean and Japanese fusion, Osaka’s dishes aren't really like anything else in town. Pimp up the usual Japanese katsu by adding some creamy kumara mousse, melted cheese and gravy. Osaka also does the best spicy Korean rice cakes, topped with crispy katsu chicken and melted cheese to soothe out the fiery spice. Try a new and different style of dining at Culprit. They offer a trolley service of tasty bites, where you pick and choose what floats your boat. A bit like Chinese yum-cha. The food is next level innovative and absolutely delish. Exhibit A: the doughnuts. They're not just a sweet tooth treat. These ones are freshly fried, hot mini doughnut, paired with chicken liver parfait. Mind-blowing stuff. Their pork studded roast duck is also not to be missed—there's no-one else in Auckland serving duck like this. Despite the fact this café is hidden, Chuffed has earned a rep as one of the best cafés in Auckland. Their dishes go back to the basics, but they do them absolute justice by mastering each and every element. From their crumpets to their humble sandwiches in the cabinet, they've nailed taste and presentation. The poached chicken sanger is the true underdog: it doesn’t sound like much, but we can assure you it’s AH-mazing. The chicken is cooked to perfection, then doused in the creamiest mayo, pressed together by two slices of toasted and crispy bread. If you ever want to just have some tapas and a good old glass of wine, head straight on over to Mezze Bar. The all-day restaurant offers a variety of different stuff, from breakfast all the way through to late night desserts. It's become a heavy favourite amongst the locals in Auckland’s CBD. You can’t go wrong with their polenta fries and tomato lentil soup, but what we love about Mezze Bar are there homemade cakes, sold by the slice. The chocolate buttermilk cake is moist and decadent and completely OTT, heated up with hot fudge sauce poured on top. The perfect way to end a busy night. Owned by the same guys behind Odettes Eatery is this inner-city restaurant, Hugo’s Bistro. The limited seating offers more intimate dining, and it's the go-to destination for the corporate workers in the city on their lunch break, or to relax after a long day at the office. The simple steak and fries is next level at Hugo’s, with their homemade café de Paris butter. If you've never experienced café de Paris butter, get on to it ASAP—dairy has never tasted this flavourful. Melted all over the hot steak, it's pure magic. Further down the CBD is a growing foodie precinct, and Cassia is one of its flagship eateries. You'll see why when you take one bite into their signature lamb chops. Packed with flavour and melting off the bone, you'll defs be ordering a second plate. Cassia’s ambience is underground but modern, and the dim restaurant makes you feel like you’re in an exclusive hidden spot. Somewhere only the well-connected people know. People like us. It’s never too cold for ice-cream, and we can always make time for Giapo. Calling Giapo a gelato shop would be an understatement—they give their customers a premium experience with attentive and personal service. The gelato flavours can't be found anywhere else either, and the way they serve them is out of this world. You haven't had a true caramel ice cream till you've tried the Giapo Buono, and there are tonnes of vegan options for our plant-based friends. 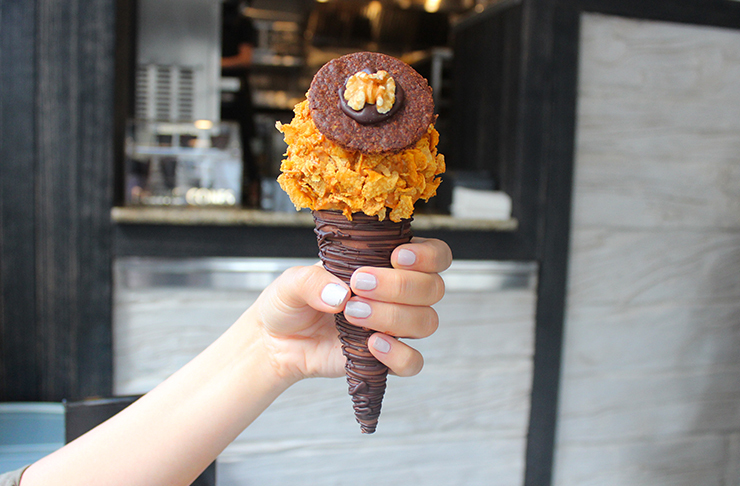 Branch out from the regular waffle cone and try their Yorkshire pudding cone, or the Maori fried bread. Vivace is warm and welcoming and they've just set up a new eatery on Fort Street. The infamous fireplace from High Street isn't there anymore, but the food is still top of the line. They specialize in Mediterranean and Italian cuisine and serve up some of the tastiest tapas in town. Vivace is known for their kumara gnocchi, and we can’t not talk about their indulgent desserts. The baked apple crumble cheesecake is a slice of creamy, crunchy, sweet heaven, and everyone deserves to experience a slice. Situated along the waterfront of Auckland city is Botswana Butchery who have been pumping out bomb-tasting food and stellar service for ages. Open for lunch and dinner (and even on the weekends) their menu has so much variety you could dine here all day with no struggles. From the smoked salmon eggs benedict, wagyu cheeseburger and the masterstock crispy duck, we cannot fault Botswana Butchery. The swanky décor adds to the bougie experience of wining and dining, and you get a beautiful view of the City of Sails. Not necessarily smack bang in the CBD, but definitely not to be neglected is trendy K’Road. Bestie Café has got the café style food down pat with their creative and fun menu. Popular for the Mexican chilli beans, another crowd favourite is the flatbread with spicy chorizo and the freshly fried peanut butter mini-doughnuts with pretzel crumble and strawberry jam. Bestie also have one of the finest looking cabinets in town, stocked with fresh-made sandwiches and sweet treats. One of our all-time faves. By night, Bestie is transformed into a bustling Lebanese diner called Gemmayze Street, and they've proven that hummus can be smoother than butter. Gemmayze Street is all about the share plates. This means you get to try as much food as possible, which you'll want to do because everything is freaking delicious. The lamb shoulder is worth a special mention as this beast is out of this world. It’s tender, succulent, juicy and flavourful. A proper star dish. Not only do you get a view of Auckland’s iconic Lightpath here (a.k.a., the pink walk), Cotto also cooks authentic and tasty Italian cuisine. And it won’t stress the wallet. Although they have a menu where everything is cheaper than 20 bucks, Cotto don’t let the cheap price get in the way of good food. The gorgonzola cheese kumara gnocchi, lamb ribs and spinach goat cheese dumplings are mandatory, and you need to finish off with the Chocolate Nemesis (great name). Don’t let the small serving size fool you: this chocolate dessert is the definition of rich and decadent. You’ll appreciate the small portion by the end.